I finished reading this novel in the month of August, I couldn't write my review then because I was engulfed by our wedding preparations. The Boy Next Door caught my interest because it was by an African writer but most importantly because it won the Orange Prize for New Writers in 2010. Consequently, I thought it was going to be a great read. I was not wrong. After all, one of my favourite novels "Half of a Yellow Sun" by Chimamanda Ngozi Adichie also won the Orange Prize for Fiction in 2007. 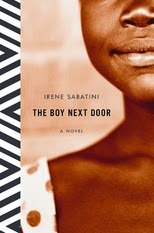 Irene Sabatini debut novel is not simply about the boy next door, it is mainly about the coming of age of Lindiwe in a deteriorating and divided Zimbabwe. Its citizens paralysed with fear and nervousness, ready to crack apart any moment soon. To make matters worse, she fell in love with a white boy (the boy next door) who was accused of murder. I crossed my fingers and wished that their love survived in their constantly disintegrating country plagued with racism and corruption. Did it? You would have to read the novel in order to find out. Irene Sabatini did a fantastic job with her debut novel. Believe it or not, writing is an art not everyone can master. So, being her first novel, she really impressed. No wonder she won the Orange Prize. Well done Irene. I took pleasure in reading "The Boy Next Door", somewhat reminded me of Americanah. I recommend. Though, bear in mind it was a long read 400+ pages. I'm going to to add this to my TBR list, Mary. I'm a little short of literature from Zimbabwe and this sounds intriguing. As an aside: I've been away from blogging for a while and am just easing back in, so I've missed any announcements you might have made about your wedding. Is it still in your future, or did I miss it completely? I was so busy that it was impossible to blog at the same time. It was a graceful day and we are reallyt grateful. I'm absolutely positive I've missed out on a lot of books that I would enjoy immensely because they are over 400 pages. I'm going to make 2015 the year of chunksters and try to get through several of them that are on my shelf. I expect next year to be the year I read the fewest books but did the most reading. Shannon, yeah tell me that.. once the book is entertaining I do not mind the pages, let the story keep going. You should not let go the opportunity to read a great tale because of the tremendous amount of pages. Sometimes, it reall worth it. I look forward to reading your reviews. Congratulations on your wedding Mary! I wish you and your husband a lifetime of joy and peace, I pray you fully enjoy growing together in love and experience all the blessings of married life. I've read "The Boy Next Door" and I loved most of it. I still have a copy of it and it's possible I will revisit it again at some point in the future. Thank you very much Tolulope. We appreciate. Yeah, being a debut novel she did a good job, really.